One mom, one toddler and a passion for learning and adventure. This is a fun project that you can make for your kids out of some pretty basic materials, that will give them hours of entertainment and spur their imaginations. I started with a big cardboard box, it has been sitting in my garage for about a month and I finally decided that it was time for it to be used. I cut it in half and trimmed off the edges. 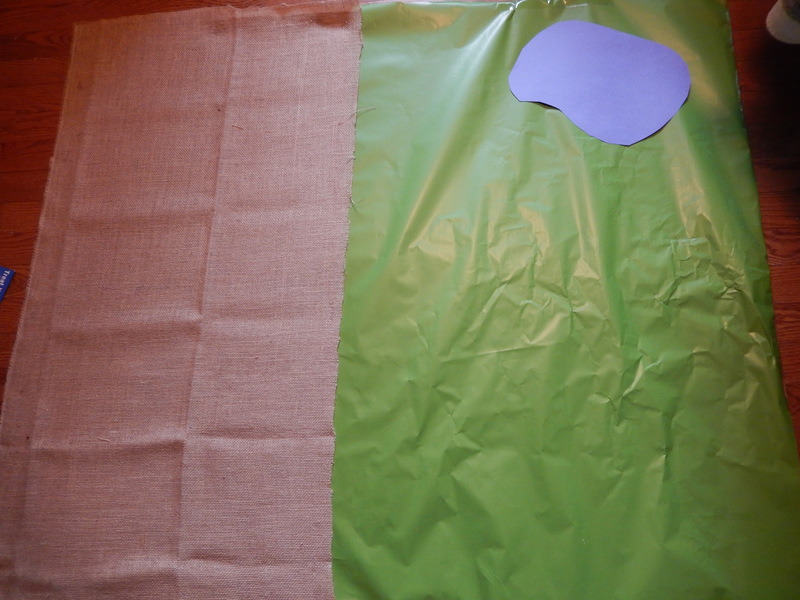 In hindsight green felt would probably have worked better for the grass than my choice, green wrapping paper but this has been an extra thrifty month for us and this was what I had on hand, however if you are looking for a more durable option go with the felt. I was initially going to use construction paper for the dirt, (I vetoed using real dirt since this is an indoor play area) but I didn’t have enough, but what I did have quite a bit of was burlap, and I figured as an added bonus it would add a bit of sensory exploration to the mat. I made a pond out of blue construction paper and my base was put together. Then I started adding little details. 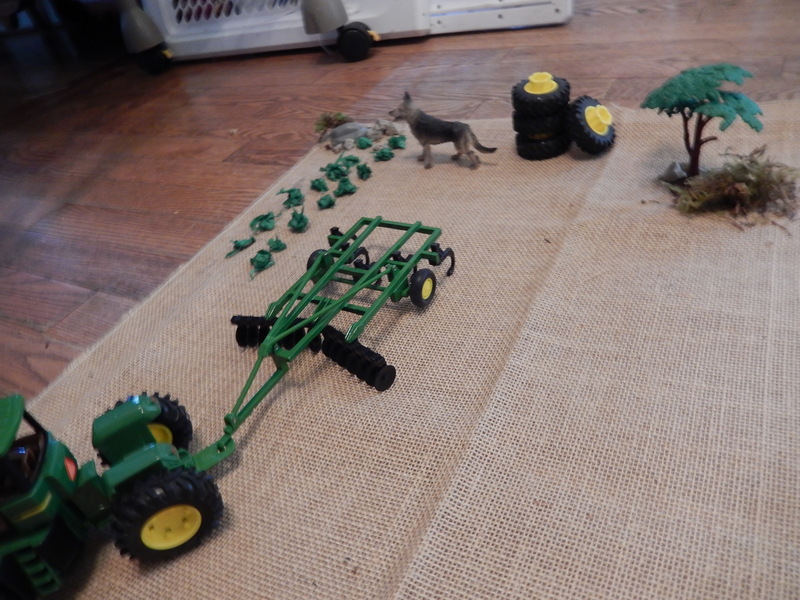 In the fields I glued down little puffs of tissue paper as crops (though not to many, feel free to add more than I did, I had a limited amount of time) and added some rocks, a farm dog, some tractors and a tree. 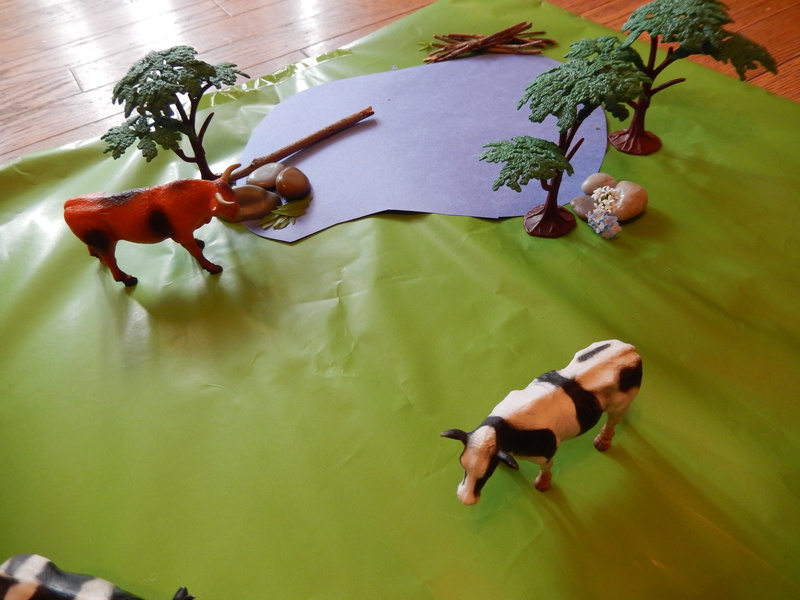 The pond gained some trees, small rocks, a few sticks as logs, and some farm animals getting a drink. 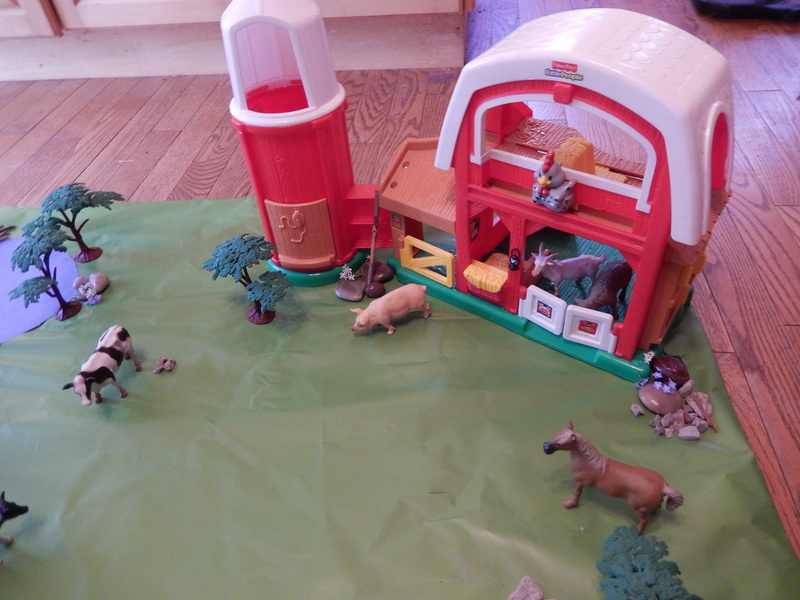 I placed in a toy barn with some more animals, trees and what not. I even picked a few small flowers and placed them around the area. 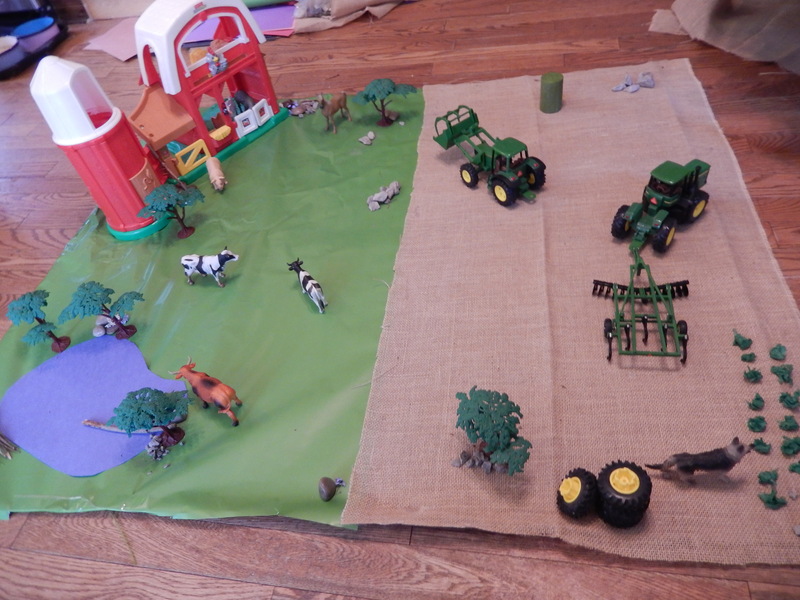 And so our farm play mat was born and ready for the little one to do some serious playing. The little man was quite excited, though anything involving tractors excites him at this point in time, and he dove right in, like a tiny Godzilla tearing through a farm. I thought it held up pretty well, the paper I used as grass ripped in one corner, which is why if I do it again I will make it out of felt. Here are some action shots of the wee man busy plowing the soil. That is what we have been up to today, thank you for joining us at Excite and Explore, we hope you enjoyed this post! 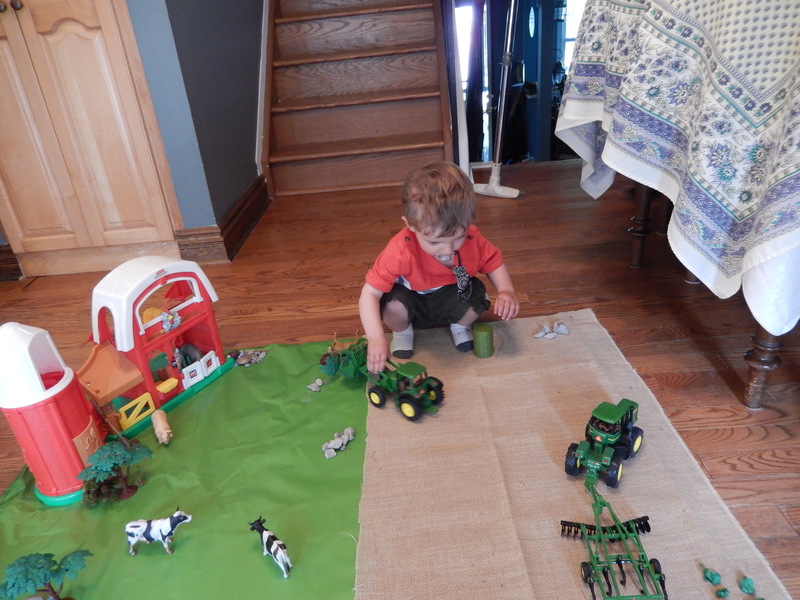 Categories: Uncategorized | Tags: farm play, imaginary play, Toddler | Permalink. I am a mom to a wonderful toddler and together we are exploring our world and learning more about it every day. Thank you! My toddler has spent every morning playing with it since I made it and it seems to be holding up! Super cute idea! I can see how felt would work much better. 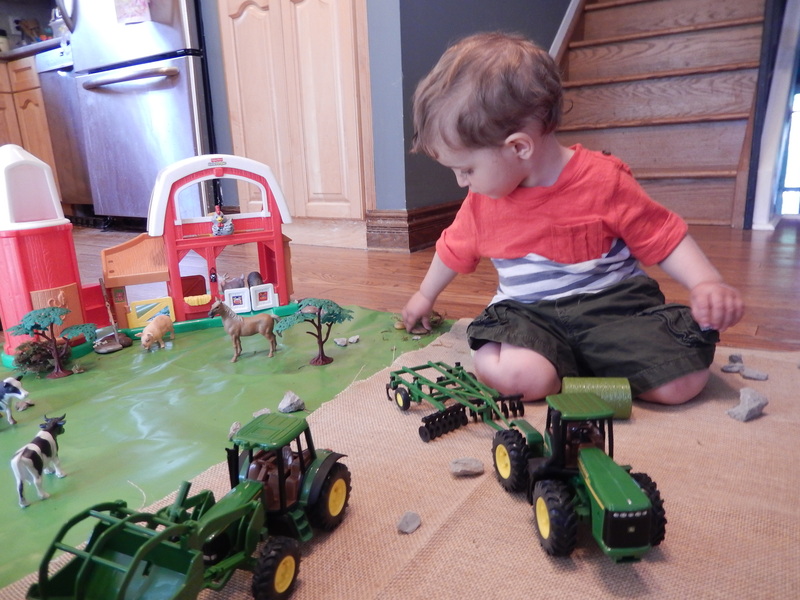 A felt mat would also work well to hang on the wall use cut out animals and tractors to play. Thanks for sharing via Family Fun Friday. What a great idea, thank you for the input! Thank you! We are having a lot of fun with it! 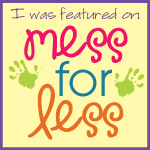 Thanks for linking up with us #pintorials Love to feature your post for my linky next week. That would be amazing, thank you! What a great mat!! I love the idea of using the burlap. Thank you for sharing at Sharing Saturday!! Thank you for having me, I’m so pleased that you enjoyed it! Welcome to Excite and Explore, a blog dedicated to raising a toddler, sharing our experiences and all the fun we have. We would love to hear what you guys have been up to! What have we been doing lately? What you may have missed. Feel free to follow us on pinterest! Visit Rachel Jones (Excite And Explore)'s profile on Pinterest.